Quercus palustris boasts large, deeply lobed, glossy green foliage throughout the spring and summer that turns orange and red in the autumn. Pretty catkins and acorns are produced, the latter being a popular treat for wildlife such as squirrels. This is an extremely elegant, gently pyramidal and spreading shaped Oak tree that will growing to 10 x 6 meters in 20 years. Quercus palustris prefers a free draining soil but is useful for damper sites as it will withstand some water logging for short periods of time. It also tolerates exposed positions. Quercus palustris is a lovely tree for stunning autumn colour. The common name of Pin Oak refers to the lower branches breaking off due to the shade of other trees in the wild and leaving pin-like stubs. For a more upright Pin Oak, consider Quercus palustris 'Green Pillar'. 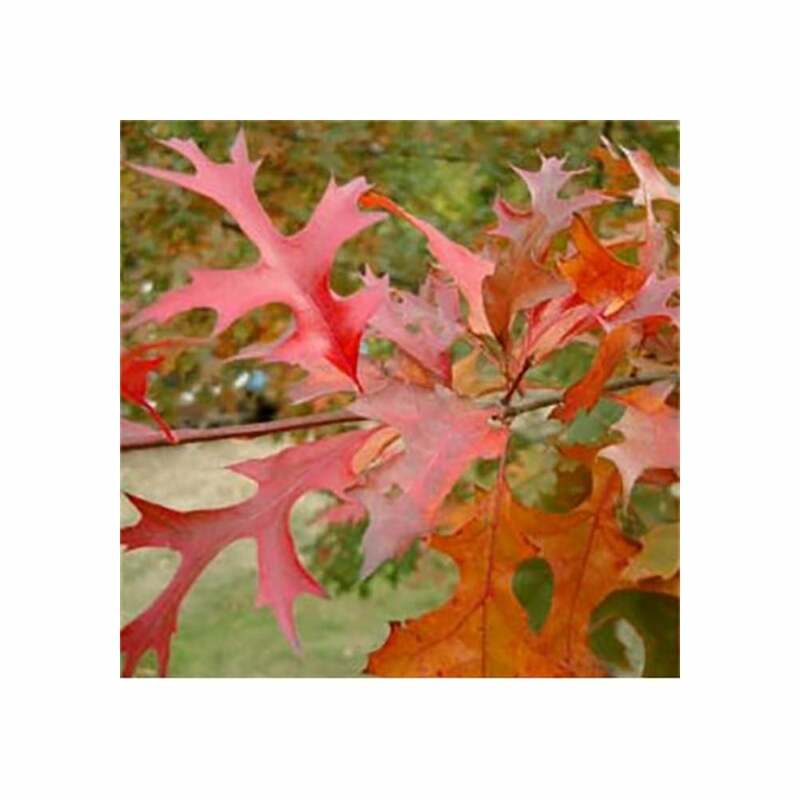 Our pot grown Pin Oak trees can be planted at any time of the year. Prepare the planting site by removing all weeds and grass within a metre of your desired planting hole. Dig a square hole as deep as your root mass and approximately 2x as wide. To help your tree establish more effectively, we advise applying root grow (sprinkle in the hole for pot grown trees), especially if you have poor soil. If you’re planting in spring, summer or dry weather, water well and regularly for the first few months. We stock a range of irrigation kits to help. Make sure to keep an eye on young Pin Oak trees and increase watering if there are extended periods of hot or dry weather. If you’re planting in autumn, you may only need to water your tree a little.